Last week, we returned from a fantastic trip through Northern Spain—from Basque Country (Bilbao and San Sebastián) to Navarra (Pamplona) to Catalonia (Barcelona)—it was an amazing experience. We saw a lot and learned a great deal about this wonderful country. Our first stop in Basque Country was Bilbao. Bilbao is one of those cities you can feel is on the move. Its once industrialized landscape is now revitalized into a sophisticated and cultured city. With its plethora of art galleries, pedestrian-friendly streets, riverfront walkway and famous Basque cuisine, it’s hard not to fall right into the culture. Bilbao itself, although compact, is larger than we expected. Like many older cities, it’s divided into new and old areas. The “New City” is quite cosmopolitan while the “Old Quarter,” or Casco Viejo, maintains its medieval charm. Bilbao’s seven original streets, Siete Calles, are located in the Casco Viejo. These seven streets run parallel to each other right down to the waterfront. The Casco Viejo is an entertaining old area, full of shops, bars and restaurants. 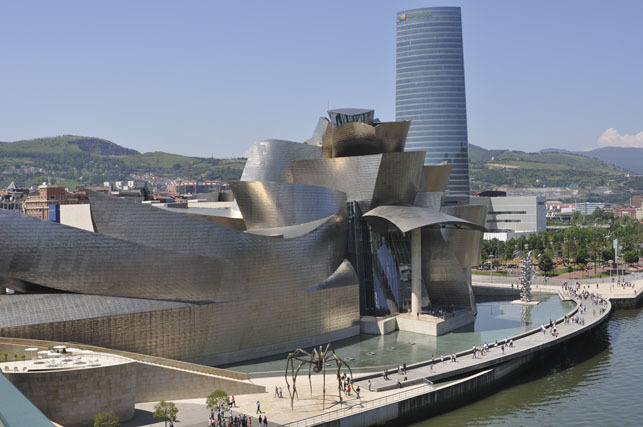 The Guggenheim Museum Bilbao is a contemporary art museum designed by the famous Canadian-American architect, Frank Gehry. Opened in October 1997, this massive, modern building is so unique it’s difficult to take your eyes off of it. The titanium, glass and limestone structure, in itself, is a work of art. 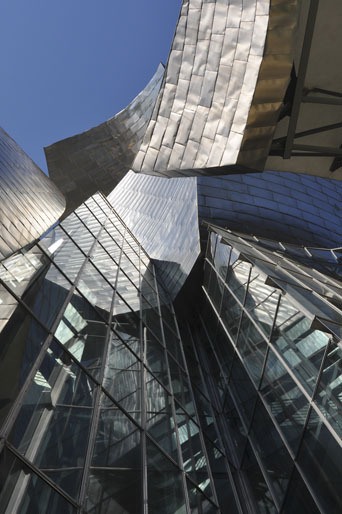 The shimmering, titanium tiles on the exterior of the museum are reminiscent of fish scales, as it is said that Gehry had a fascination with fish as a child. Many people say the Guggenheim’s impressive structure overwhelms its actual contents. It’s difficult to say, although, the building is something to see. 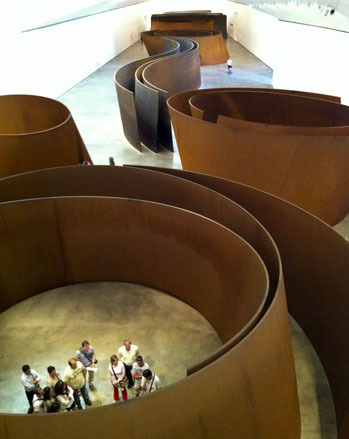 One of the permanent exhibitions that impressed us was The Matter of Time, by Richard Serra. This series of enormous, steel sculptures provided us some amusement walking in and around this maze of metal. Other impressive sculptures are actually found outside the museum. 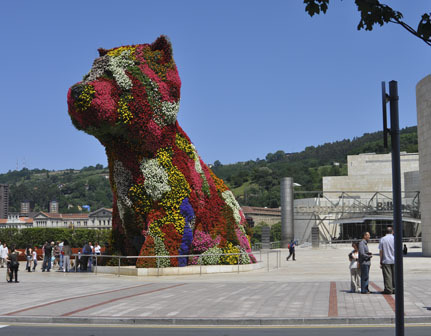 Puppy, by Jeff Koons, is a 43 foot tall West Highland Terrier topiary with fresh flowers. Puppy guards the front of the museum. It’s amazing! And Maman (French for Mom) stands behind the museum. 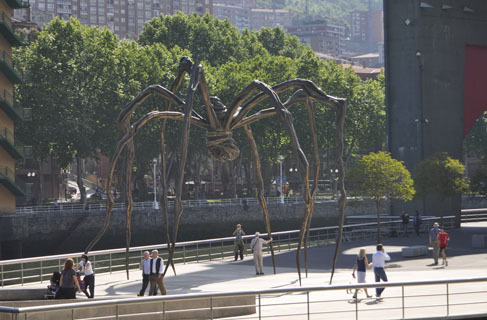 Maman is a 30 foot tall bronze, marble and stainless steel spider by Louise Bourgeois—so fascinating for its realistic qualities. Another museum we ventured into was the Fine Arts Museum (Museo de Bellas Artes) which is a short stroll from the Guggenheim. This museum houses a wonderful collection of art ranging from the 12th Century to present day, including important works by Basque artists. It’s worth the stop. 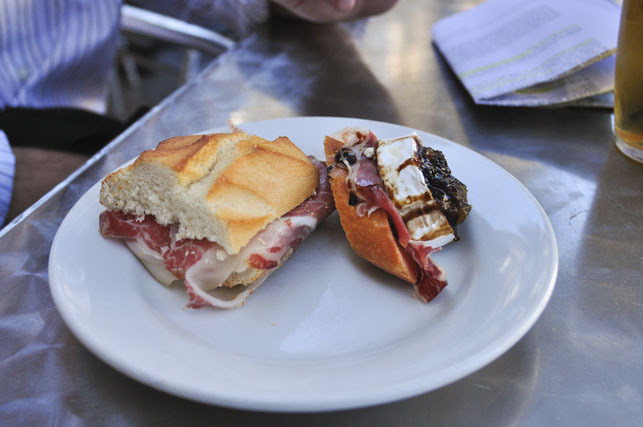 This entry was posted in Spain and tagged Basque, Bilbao, Guggenheim Museum Bilbao, Pintxos. Bookmark the permalink. This looks like a place anyone would like to visit. 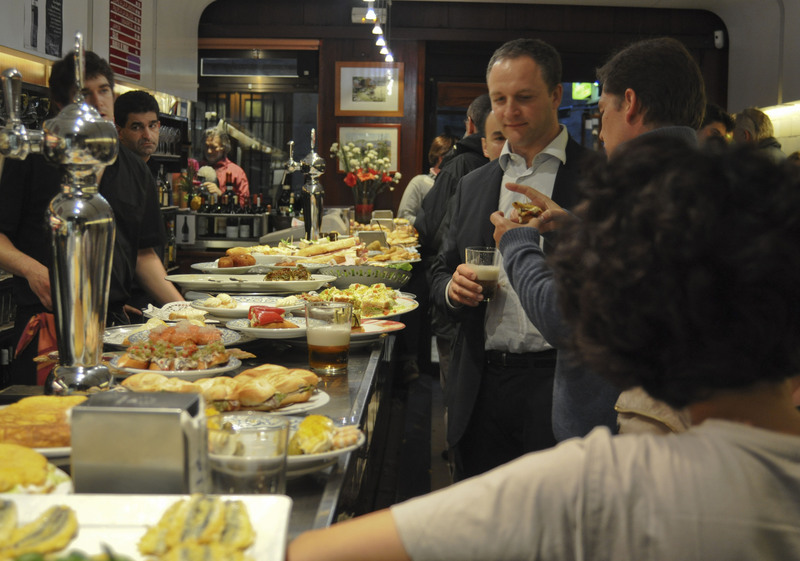 The pintxos bar and food specialties looked so appetizing. The pictures are great and the the Matter of Time was interesting. I love the Puppy too. What wonderful memories! I think you and Dad should build a “Puppy” in the front yard. haha.